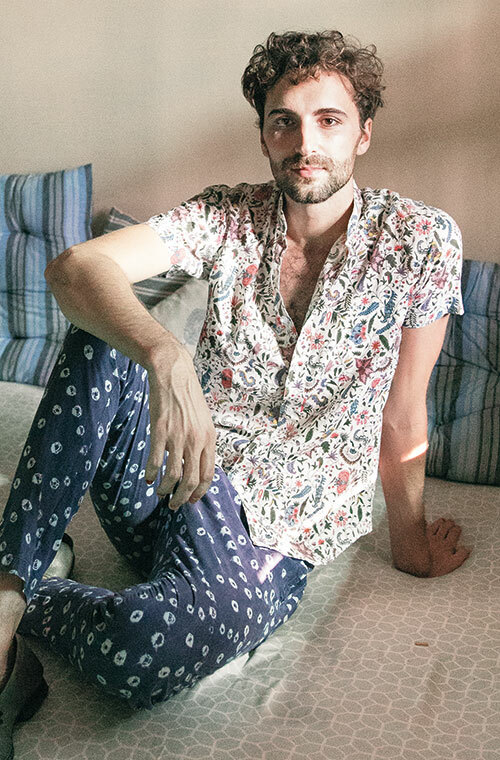 Printed shirt, from Idli, by Thierry Journo. Polyester bell-bottoms, from a street store; leather shoes, his grandfather’s. All from Will’s personal collection. 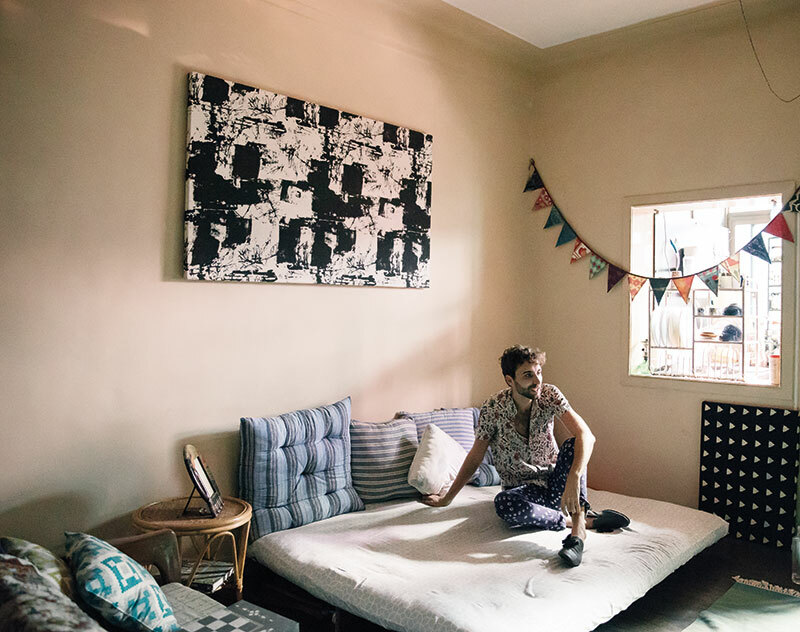 There are many intriguing facets to this multi-hyphenate, but the one that piques your fancy most is his taste in fashion, with handmade being the pivot of his style. “Fashion is my life. Not in a dramatic way, but I am always thinking about fabrics. My tailor at any time can be my dearest friend or my greatest enemy,” he says. Several pairs of shoes from both his grandfathers, a cream tussar kurta — from his grandmother’s archival collection — together with his mother’s tuxedo jacket and the cream two-piece suit with the tan Nehru cap that he stitched for the opening of Caffé Palladio Jaipur are a few closet-charmers he absolutely treasures. Suede shoes with tassels, from Amorio, by Saurabh Goyal. Floral print poplin shirt, bandhani cotton pants, both custom-made. All from Will’s personal collection. 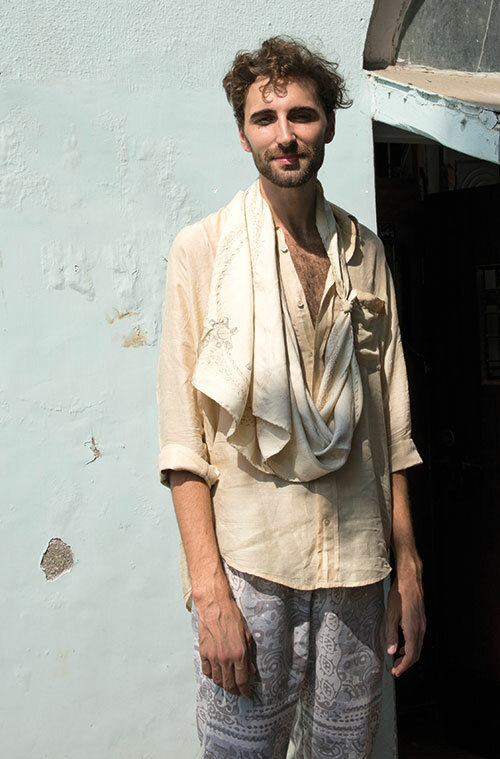 Hailing from Wisconsin, USA, the desire to learn Hindi brought Mulford to India seven years ago and he’s stayed on ever since. He has a fervent admiration for what he calls ‘the men of the street’ — auto drivers, porters, old uncles, pandits, imams, fishermen — as well as Jor Bagh aunties. “Style can be found everywhere and oftentimes my brightest style inspirations come from the most unlikely sources.” The itinerant fashionista disparages fast fashion and finds sartorial keepers in but a few labels. 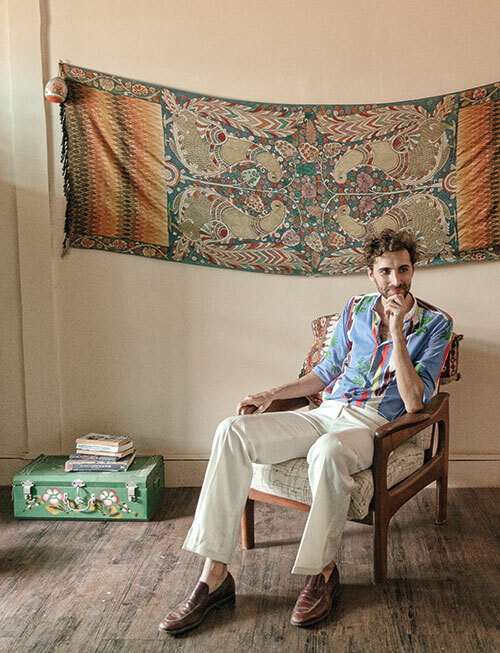 His coterie of go-to brands includes Idli, by Thierry Journo, who is a Jaipur-based French designer, for the gorgeous prints, and P. Mith, a Bangkok-based menswear label. He digs men’s fashion of the ’50s and leans towards Baroque motifs for womenswear, and this quite naturally reflects in his own sense of dressing which is also gender-fluid. “Border&Fall recently launched The Sari Series: An Anthology of the Drape project and I have been having a field day with the drapes. Why can boys not wear a sari is the question we should be asking ourselves,” he asserts, admitting that the sari is what he would choose to wear in a fashion quandary. 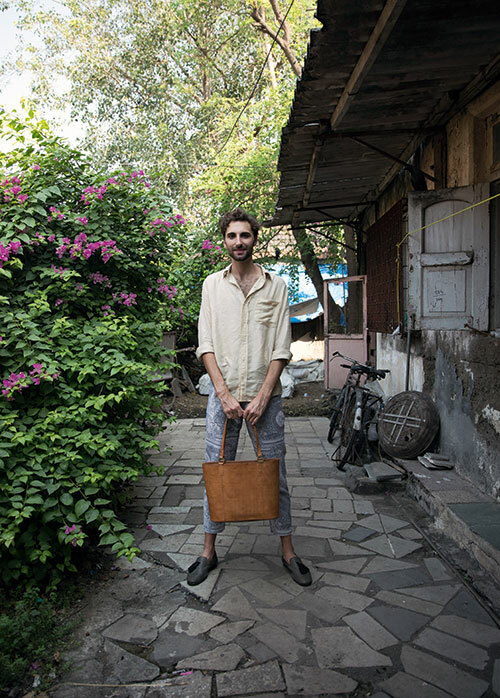 Kurta, from Idli, by Thierry Journo; suede shoes with tassels, from Amorio, by Saurabh Goyal. Bandhani cotton pants, custom-made. All from Will’s personal collection. 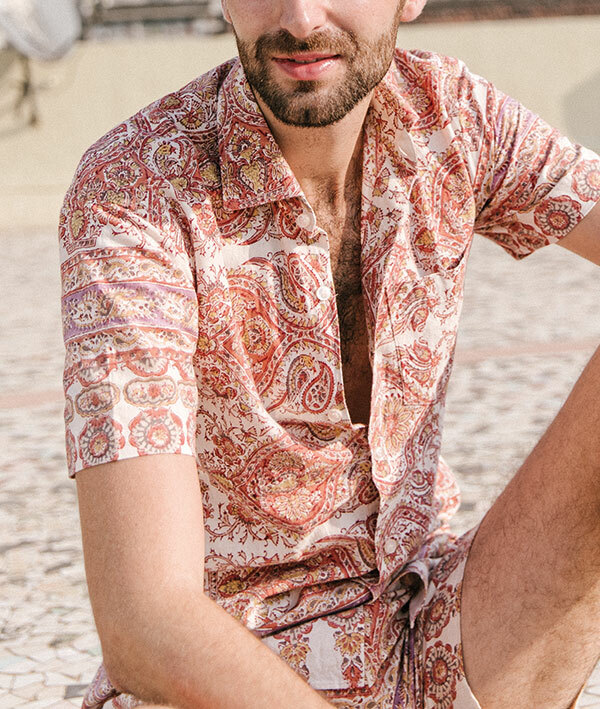 Shirt, shorts, both custom-made from a tablecloth, from Anokhi; from Will’s personal collection. 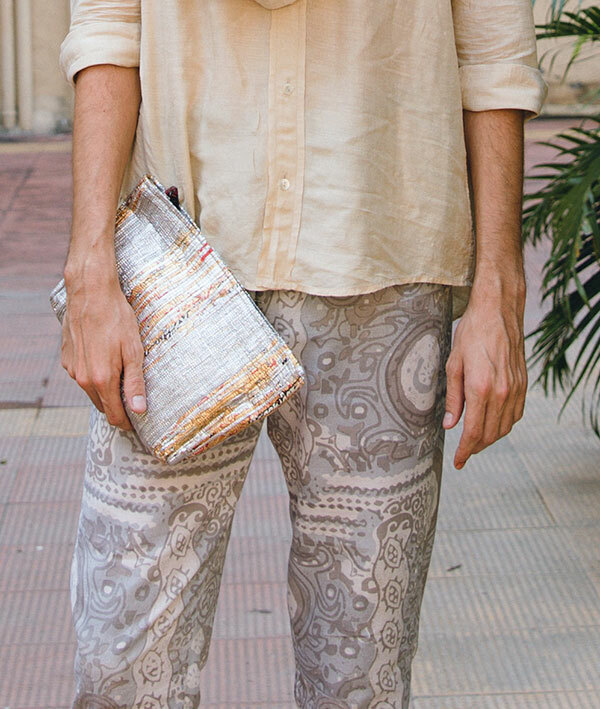 Tussar silk shirt, leather handbag, both from Fabindia; suede shoes with tassels, from Amorio, by Saurabh Goyal. Pants, custom-made. All from Will’s personal collection. His nomadic personality has been enriched with experiences in a way that only travel can. With a lucid love for India and its cultural beauty, he says, “I have to say that there is no other place that I have lived where fashion has felt as genuine and lived-in as in India.” And it is amusing to learn that he feels his most powerful when clad in a pair of cream, polyester bell-bottoms that he discovered in Dadar market. “I wear them when I go dancing and I swear they help unleash a beast,” he announces with certitude.